New York Times bestselling author Joan Johnston tells an impassioned story of love and danger, ambition and family that features a man who has turned his back on his family's ranch to pursue his fortune as an attorney at Houston's most powerful law firm. Even though the stress and the punishing hours of his job as a litigation associate have cost him his marriage and quality time with his two young daughters, Luke Creed remains fiercely driven. When Luke takes on the defense of a pharmaceutical company in an explosive wrongful death suit, he is surprised to square off against Amy Hazeltine Nash, his high school sweetheart. A single mother recovering from a failed marriage, Amy is a passionate advocate for her bereaved client and is shocked that once-rebellious Luke is now representing corporate interests. But Amy cannot deny her rekindled feelings for Luke. 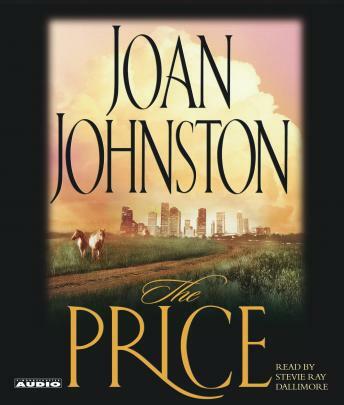 From the towering skyscrapers of Houston to the majestic plains of south Texas ranch country, The Price explores the questions of what is truly important in life and how high a price a person is willing to pay to achieve his or her ambitions. This story was very detailed, with many characters. Had some good romance scenes and a great ending! I would give this book three stars for romance and four stars for story interest.